Now that we potentially all have attention spans less than that of a goldfish – can’t believe you’re still reading this! – it is apparently more important than ever that we distill information down into small, digestible bits. One way we do this is by labeling everything, especially food. This is so we can recognize it, so we can boast about it, so we can post a photo of it, so we can pay more for it. So we can say, Oh, don’t mind me, I’m just eating my superfood salad over here. Goji berries, acai, spirulina, wheatgrass…the list of trendy branded superfoods goes on and on. Purple foods are rich in anthocyanins, a specific type of antioxidant. Western society, particularly America, has some serious food issues. We are collectively overfed and undernourished. We all know that obesity, heart disease, diabetes and other lifestyle diseases are on the rise, and yet still we consume on average more than twice the calories we need in a day. We’re overwhelmed by choice and information and the constant barrage of marketing thrown at us every second. We’re no longer able to think for ourselves. One of the things we’ve missed most since we started traveling just over a year ago is our own flock of backyard chickens. When we decided to set off on our big trip, we sent our six ladies up to live on a farm in Weld County (thanks, Tammy and Chris! ), and we still get eggs from that farm occasionally. We’re really looking forward to keeping laying hens again once we find Quiet Farm. I consider eggs to be one of the world’s most perfect complete foods. They were vilified for so long – remember when we all only ate egg-white omelettes and entire boxes of Snackwell’s fat-free cookies? – but more and more evidence demonstrates that quality eggs are an essential component of a healthy diet. They’re loaded with good fat, protein, vitamins and minerals, and the whole “eggs cause high cholesterol” myth has thankfully been debunked. (Our bodies produce the vast majority of our own cholesterol; what we eat has little impact on our cholesterol levels, though what we eat has a massive impact on every other aspect of our health.) The key, as with every other animal product, is to purchase the best eggs you can. And this is of course so much more difficult than it seems, because what are the best eggs? Just a tiny corner of the egg section at our grocery store. We no longer purchase supermarket eggs; we buy them from local feed stores, where backyard chicken keepers sell their excess, or we get them from farms we volunteer on, or from friends with flocks. (In the winter, natural egg production slows down dramatically; eggs are a symbol of spring and rebirth because poultry start laying again when the days get longer.) Recently I found myself staring at the egg case at our grocery store, and I understood completely why people find food shopping so overwhelming – especially if you care about animal welfare, the environment and/or your own health. How in the world are you supposed to know which is best? The answer in this case is none of the above, but we’ll get to that in a minute. First, let’s revisit and debunk a few egg myths, shall we? There is no difference in nutrition or flavor between white and brown-shelled eggs. Shell color is determined by the breed of chicken and nothing else. 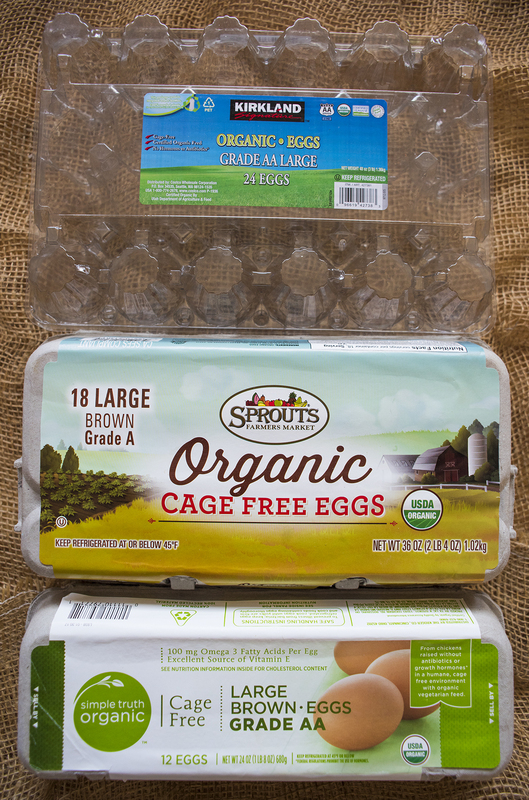 Egg producers and grocery stores figured out that customers think brown eggs are better, so they charge more. And we pay it. Many small farmers keep Araucanas or other “Easter Eggers,” because they lay turquoise, pale blue or seafoam green eggs, and they charge a premium for these eggs. Gorgeous, to be sure, but no nutritional benefit. Very few words on egg labels are regulated. Natural, free-range, pastured, cage-free, farm-fresh? These mean nothing, and egg producers can use them on any carton. The only labels that are regulated are organic and non-GMO, and even those are sketchy (you get to hire your own inspector!). And if there is any sort of pastoral farm scene with a red barn and a white picket fence, you know for certain those hens lived in a crowded, artificially-lit warehouse. The mouse may have been vegetarian, but the chicken certainly isn’t. Unrefrigerated eggs in a German supermarket. American eggs are kept refrigerated, while those in most of the rest of the world aren’t. When eggs are laid, they’re coated with a natural protective bacteria. The USDA requires commercial egg production facilities to wash and sanitize (i.e. bleach) all eggs, which removes this protective coating and hastens their deterioration – hence the need for refrigeration. This is because the factory farming system in this country produces decidedly filthy eggs, and the USDA has decided that washing the eggs is better than potential foodborne illness. If you buy eggs from a neighbor or local farm, store them unwashed in the refrigerator. This will extend their shelf life; wash the eggs just before you crack them. Eating eggs does not increase cholesterol levels. 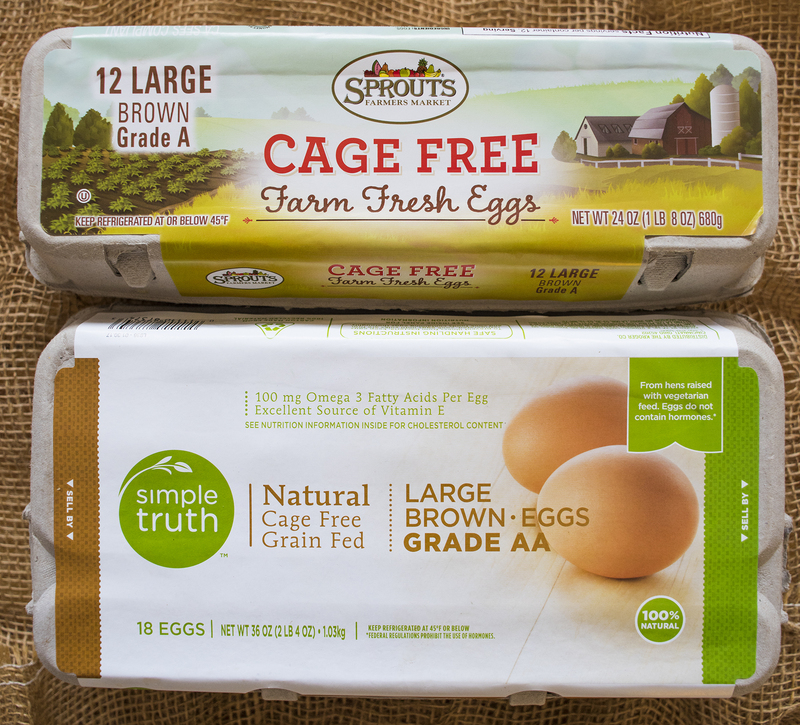 Eggs from true free-range flocks are nutritionally superior. They’ve been repeatedly shown to have higher levels of omega-3s, plus more vitamins A, D and E. Plus, they’re actually lower in saturated fat and cholesterol, even though we all know that eating eggs does not increase cholesterol levels, right? Laying hens have the worst lives of any factory-farmed animals. They spend their entire lives in a space less than the size of a standard sheet of paper, and they cannot perform any of their natural activities, including preening and dust-bathing. They cannot even flap their wings. Thankfully, their lives are mercifully short, about eighteen months (compared to a natural life expectancy of eight to twelve years). 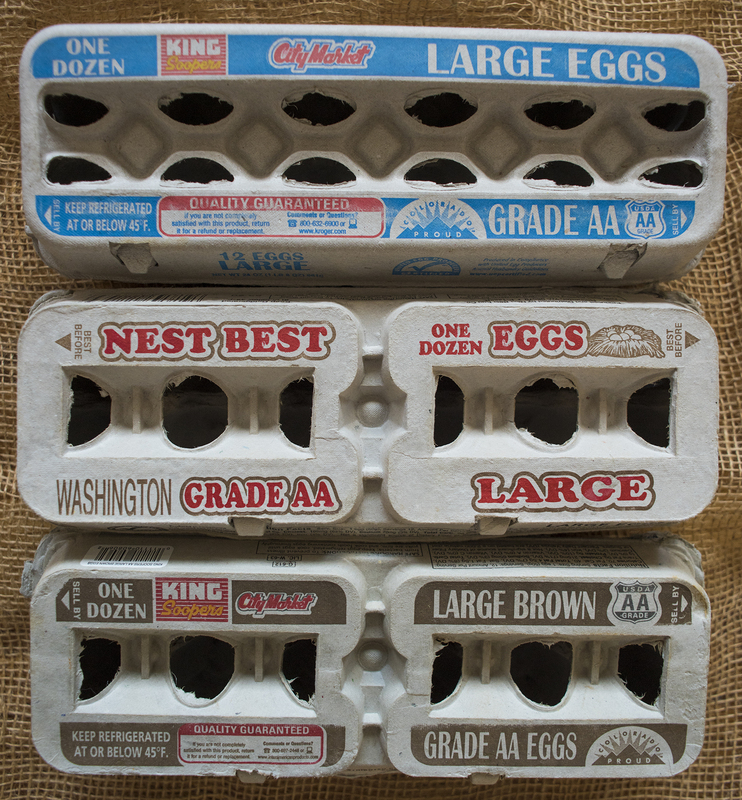 Back to our original question: which of these eggs are best? Friends, we like to deliver truth here at Finding Quiet Farm. And the truth is, if a certain egg production facility is big enough to appear on the shelves of your grocery store, they’re almost certainly a battery operation. 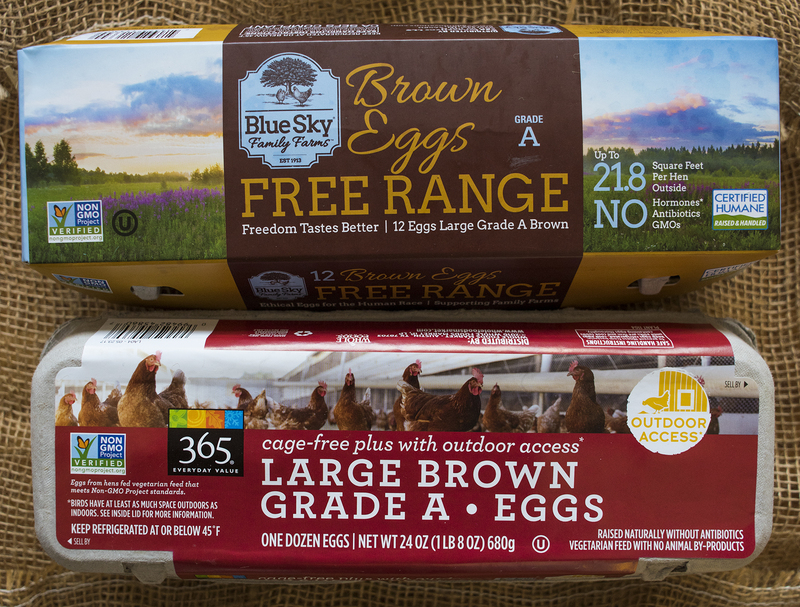 Major supermarket corporations need a guaranteed quantity of eggs delivered on a reliable schedule, and anyone who has kept chickens knows that true free-range poultry cannot be counted on to do anything reliably, except escape from their fenced area. So these operations that sell eggs to your store are large enough that their hens can’t be free-range, but because those labels aren’t regulated, you can’t do anything about it. And please remember: just because those eggs are “organic,” it doesn’t mean the birds had a good life. Battery hens can be fed certified organic feed so that their eggs are worth more to the customer, but the hens still lived a horrific existence. Organic means nothing when it comes to an animal’s quality of life. It simply means that no pesticides were used in their feed. What’s the answer? If you’re going to spend money on good food, upgrade your eggs first. Find someone with backyard chickens, or buy from a local farm. Lots of small, local farms keep poultry flocks, or they know someone who does. Or get your own backyard flock! Remember, you vote every time you spend money, and cheap eggs aren’t good for chickens, the environment, or your health. All of these are worth the extra pennies. One of the toughest things about deciding that you want to become a farmer (especially when you decide this in your late 30s) is that you can’t really go to Farm School, mostly because it doesn’t exist. Farming used to be a profession passed down from generation to generation; farms stayed in the same family for decades, and sons and daughters learned how to care for animals and grow food and nurture the land from the time they were tiny. This is so much not the case any longer. We named February our Month of Education, and so in our pursuit of self-designed Farm School, we attended just about every single course, seminar, conference, talk or networking event geared towards farmers and ranchers in Colorado. We’ve been to a lot of classes since we started seriously planning Quiet Farm three years ago, but this past month took our education to a new level. We went to a grantwriting course and Alfalfa University and a tax planning class and a potluck farm forum and toured a hydroponic farm and a million other events. And we went to the State Capitol, too. We promise that this is our last post on sugar (for now). As you’ll remember, in this three-part series we’ve already talked about sugars you have at home and sugars used by the food processing industry. Now, let’s discuss how the sugar industry has worked so hard to convince us all that sugar is not only benign, but actually good for you! Before we get into the sugar industry, we’d like to clarify exactly what we mean by added sugars. An added sugar is any quantity or type of sugar that doesn’t naturally occur in a specific food. A perfect example of this is applesauce: in its simplest form, applesauce is made by cooking apples until they’re soft, then mashing or puréeing them. Lots of ingredients can be added to applesauce, including spices like cinnamon and acidifiers such as citric acid to preserve color. Fresh apples contain plenty of natural sugar; primarily fructose, but also sucrose and glucose in small proportions. Most store-bought applesauce, however, includes added sugars, in the form of high-fructose corn syrup, honey or any of the other sweeteners we’ve mentioned. So if that applesauce label were adhering to the now-abandoned revised nutrition labeling laws, it would have to list both the naturally occurring sugar in the apples, plus all of the sugar added by the manufacturer. Hopefully this clarifies the concept of added sugars – it doesn’t occur naturally in the food or drink. Both the apple and the soda contain sugar, but all of the apple’s sugar occurs naturally. All of the soda’s sugar is added. The sugar conspiracy is one of the most significant health-related stories to appear in the news recently. Essentially, the claim is this: fifty years ago, the sugar industry funded studies on the potential correlation between sugar and heart disease. When preliminary studies did appear to confirm this link, the studies were shut down, and research findings were concealed. The Sugar Research Foundation also reportedly paid Harvard scientists to obscure the link between sugar consumption and heart disease, pushing them to blame saturated fats instead. And that, friends, is one reason why we’ve spent decades being told not to eat bacon, eggs, butter, cheese or burgers – because they cause heart disease. While excessive consumption of the low-quality saturated fats found in most American diets definitely isn’t a healthy choice, the point is that sugar should also shoulder a lot of the blame. And we now consume a lot more sugar than we do saturated fat, and our heart disease rates are still rising. All dried fruit contains natural sugar, but processors add a lot, too. Buy unsweetened dried fruit (this means no Craisins!). Humans instinctively love the taste of sweet things; sweetness implies carbohydrates, which are quickly converted to energy in our bodies. Now, however, our satiety point is ever higher: as food manufacturers use more and more sugar (or artificial sweeteners), we need more and more in order to stay satisfied and for things to taste sweet. In short, we’re hooked. Sugar has repeatedly been shown to have addictive qualities; one controversial study demonstrated that rats preferred sugar to cocaine. Notice the percentages? If it’s only 27% juice, the rest is most likely corn syrup, water, colorings and flavorings. And even if it’s 100% juice, it’s still sugar. While our entire standard American diet (cheap meat! low-fat dairy! refined starches! hold the vegetables!) is to blame for the astronomical rates of obesity, diabetes and heart disease in the U.S., sugar is a big part of this – and by far, we consume the vast majority of sugar in sweetened beverages. Coca-Cola has spent millions funding studies shifting blame for obesity away from sugary drinks and onto “lifestyle choices,” and we’ve long been told that “fruit juice is part of a healthy diet” – remember every breakfast commercial with its tall, frosty glass of Florida orange juice? But soda and fruit juice are still simply liquid sugar, and we’ve been convinced that drinking our calories doesn’t count. This is proving immeasurably detrimental to our health. They all contain sugar. But they also contain fiber. Drinking juice, or soda, or sweetened coffees or teas, or energy drinks, is basically a great way to mainline sugar, with no health benefits whatsoever. Eating whole fruits and vegetables, on the other hand, offers your body accessible sugar – with the immensely important addition of fiber. Fiber is key, because it acts like those traffic lights allowing timed access to busy highways: it slows the sugar down in your body, giving you more time to absorb it. This is precisely why a soda gives you a sugar rush and then a crash, but a roasted sweet potato allows for sustained energy. The standard American diet is shockingly low in quality fiber, and this deficiency seriously affects our overall health; increasing rates of various GI diseases, including Crohn’s, IBS and colon cancer, prove this. For optimum health, you have to control the way your body absorbs sugar, and the fiber in whole foods does just that. Salted peanut butter chocolate chunk cookie, anyone? Let me be clear: I am in no way advocating a 100% sugar-free diet. First, it’s virtually impossible to achieve, and second, it takes a lot of the joy out of eating, which should be one of our greatest pleasures. I obviously bake frequently, and I use real sugar when I bake. But I want people to know when they’re eating sugar. When you drink your calories, or when you eat yogurt that doesn’t taste that sweet, or when you drown your industrial burger in high-fructose corn syrup, you’re consuming a ton of sugar, but you’re not getting the true enjoyment out of sweets. I want people to eat delicious, satisfying, well-made desserts, but I also want people to appreciate those for what they are: occasional treats. Hidden sugar simply does not need to be part of every single food, beverage, condiment and snack we consume, but our processed food industry has convinced us otherwise. So after all this lecturing, how can you reduce sugar in your own diet? It’s actually pretty simple. Eat whole foods, including unlimited fresh fruit and vegetables. Eat whole grains and quality fats, like good butter and olive oil. Work on your own sugar satiety point. If you regularly sweeten your coffee or tea, start by using a little less. Then a little less, then a little less again. Do this gradually. Eventually, you’ll reset your own taste buds. Don’t drink your calories. Despite what the label says, there is no health benefit, and you’ll end up eating more because drinks don’t satisfy the way actual food does. Black coffee, unsweetened green, black or herbal tea or sparkling water with lemon will do just fine; stay away from fancy juice bars. And soda is poison. End of story. Read every single ingredient label. Learn the names of all the industrial sugars. Then avoid them. Even better, save yourself lots of reading time by purchasing foods without ingredient labels, like fresh produce and bulk grains. And above all else, cook or make it yourself. When you prepare food from scratch, you control exactly what’s in it, and you know that you don’t need six teaspoons of sugar in your morning yogurt, or eight teaspoons of sugar in your coffee. Thanks for following our sugar series! If you’d like to read more about the processed food industry and the sugar conspiracy, I’d highly recommend these two books: Food Politics, by Marion Nestle (or anything else by her) and The Case Against Sugar, by Gary Taubes. And let us know what else you’d like to learn more about, and we’ll get on the case! In Part One of our series on sugar, we discussed the most common sugars you might have at home and typically use in your own drinks and baked goods. Food processing companies, however, have access to dozens more ingredients that they can use in their products, all of which are sugar – but under different names. Here’s a fun game: how many different names for sugar can you find on this ingredient label? Keep in mind that labeling laws in the U.S. require a product’s ingredients to be listed in descending weight order, with the most prevalent ingredient first and so on. Because added sugars are in at least 75% of all processed foods (a conservative estimate), manufacturers are understandably wary of listing sugar as one of the first three ingredients, even if that’s technically true. So the loophole here is to obviously identify sugars individually – that is, maltodextrin separate from high fructose corn syrup which is separate from invert sugar and so on. Did you know that sugar goes by over 60 different names on American food labels, and anything ending in “-ose” is sugar? If you see more than three of these on a product label – especially if they occur within the top three ingredients – put it back on the shelf. It’s February, and in America that means we’re celebrating both American Heart Month (take care of your heart!) and Valentine’s Day (so much excess sugar!). Ironic, no? We’re going to return to travel posts from our winter trip to Europe shortly, but in every single one of my recent corporate presentations, I’ve been asked about sugar. Therefore, I think it’s time that your trusted team over here at FQF HQ answer some questions about this ubiquitous yet widely misunderstood ingredient – one that we absolutely need to survive but that is also making us very, very sick. Oh my goodness! So very many sugars! All in my own cupboard! We’re going to start with the basics, and we’re going to break this post into three parts because it’s that lengthy and it’s that important. (Also, I don’t want you to tune out due to boredom.) I’d argue that no other single ingredient in our collective Western diet right now is as significant as this one, so let’s get a few things straight. Let’s break that definition down a bit further: almost every single food we eat – fruit, vegetables, dairy – contains some quantity of naturally occurring sugar. It’s a carbohydrate, and it exists in simple and complex forms, and we need it to survive. But it’s not so much the naturally occurring sugars that are killing us, it’s the added sugars in just about everything. In this first section, we’re going to talk about commonly available sugars: the ones we might find in our grocery store or pantry, the ones we use every day in our own coffee and tea and cookies and other things we make at home. And in the second section, we’re going to talk about industrial sugars: the ones that are added in for us, the ones we’re totally addicted to and the ones we eat way too much of. Finally, we’re going to discuss how the sugar industry has conspired for decades to convince us that butter and cream and eggs and bacon are the true villains, not sugar, even though they’ve long known otherwise. One of the comments I hear most frequently in my cooking classes and presentations is that “it’s impossible to eat healthy on a budget.” I wholeheartedly disagree with this statement, and to prove my point, I decided N and I would take part in the Food Stamp Challenge. In Colorado, the challenge is organized by Hunger Free Colorado; your state will have different resources available. While SNAP (Supplemental Nutrition Assistance Program) benefits vary from place to place and family to family, in Colorado food stamps amount to approximately $4.20 per person, per day. That amounts to $1.40 per meal, if you eat three meals a day, or about $29.40 per week; that number encompasses everything you consume, including drinks and snacks. (Legally, you cannot buy alcohol, tobacco, lottery tickets or non-food products with food stamps, but unfortunately you can buy soda, energy drinks, candy, cakes, chips, cookies, ice cream and plenty of other unhealthy items.) This is going to take some planning, and some smart shopping. Here’s the tricky bit, though: SNAP benefits can’t be used for any sort of takeaway food, and can’t be used for anything consumed within a store. So no prepared deli items, no to-go coffees, no rotisserie chickens. It’s easy to see why smart hunger relief experts advocate cooking classes along with SNAP benefits; to make the most of this program, you really need to know how to cook from scratch. Since my household comprises two adults, I’ll allot us a total weekly budget of $58.80. And since I want to play in the most honest way possible, I’ll plan for the way we currently eat: we drink black coffee in the mornings but don’t eat an early-morning breakfast; we typically eat around 10AM and 4PM (it works for us). We also eat very little meat, so going mostly vegetarian won’t be much of a struggle; this budget definitely doesn’t allow for a lot of good meat. And we only eat at restaurants when we’re traveling, so planning and cooking all of our meals at home won’t stress us, either. Scanning for sales is key to eating well on a budget. A challenge like this is necessarily a snapshot in time. We’re doing our challenge in December, which definitely makes most fresh fruits and vegetables harder to come by in our Rocky Mountain region – and they’re certainly not local, except for onions and greens! Fresh produce would be more abundant and less expensive in late summer. To play fair, I am not using our backyard honey, or my own canned and frozen goods pantry. I have dozens of jars of applesauce, salsa, Western Slope peaches and other homemade canned goods, plus lots of produce in the freezer, but since I can’t truly ascribe a dollar value to these, we’re not eating these during the challenge. I refuse to dramatically change our standard eating style in order to adhere to the budget; I’m not going to add cheap meat or nutritionally devoid, high-sugar cereal to our shopping list just to have something on the table. That isn’t what we eat now, and I believe the point of this challenge is to make fresh, delicious, nutritious food on a limited budget – not to just eat for the sake of eating. As mentioned above, we’re a household of two healthy adults, and we only eat two meals a day. Your own household’s food stamp challenge will look very different, but we would love to hear about it! Some of our food stamp challenge ingredients. Embrace the bulk department. Thanks to savvy shopping and the discount table, this is less than $10 of healthy, nutrient-dense fruits and vegetables! And here is our simple seven-day menu plan; again, we start with a pot of black coffee and only eat two meals per day. For snacks, we eat fresh fruit or raw vegetables, plus a handful of almonds and pumpkin seeds. Remind me again why vegetables are boring? Our menu wasn’t really that different from what we eat on a regular basis. Each day included at least four servings of various fruits and vegetables and usually more, plus grains and legumes. Virtually everything we ate was healthy, flavorful and made from scratch. We didn’t feel hungry or deprived, but I can easily see how someone accustomed to eating at restaurants and/or eating a lot of meat might find this challenge…well, challenging. I chose bacon as our only meat for the week because it offers so much flavor in even tiny quantities. In addition to adding it to pasta and soups, I also used the rendered fat for sautéing vegetables and greens for extra savory punch. Skipping the bacon entirely would obviously leave about ten percent of the weekly budget for other items, but that’s a sacrifice I’m willing to make. I’d rather eat a small amount of good, flavorful meat than a lot of cheap meat. I made four quarts of my own yogurt from one gallon of whole milk; the starter culture only has to be purchased once since you use a bit of your own yogurt as the starter for future batches. Plain full-fat yogurt made from good milk is a great source of quality protein, fat and calories, and dramatically cheaper than buying it premade. Does it still count as breakfast if we eat at eleven o’clock? It’s virtually impossible to eat purely organic on a budget this tight. While I appreciate the virtues of organic, with so little money to spend I’d far rather eat more conventional fruits and vegetables than just a few organic ones. Value for money wins here, although some of the discounted produce was organic. I did miss having access to a well-stocked pantry, specifically various oils, vinegars, cooking fats (including good butter), seasonings and condiments. It’s very easy to make delicious, healthy food by just dressing it up a bit, and citrus, spices and other flavor enhancers really come in handy. I also really missed cheese. We eat a lot of cheese, both on its own and as a garnish for vegetables and grains, and while I love queso fresco, I really enjoy using a variety of specialty cheeses in almost every meal. Plus, good cheese can often be found at a discount at our grocery store, too! Because we’re obsessed with aesthetic perfection and meaningless sell-by dates, it’s easy to find supermarket bargains. Flexibility is absolutely key. I bought what was on sale, rather than what I necessarily wanted. If you’re going to cook well on a budget, pay attention to store advertising circulars, clip coupons and learn to adjust your meal plan based on what’s available at a good price, rather than what you feel like eating. Our local grocery store has recently started selling blemished or undersized produce at a discount. This produce made all the difference in our food stamp challenge; most of our fruits and vegetables came from this table, usually packed at three for $0.99. I also always search for items close to their sell-by date that the store is looking to offload at a discount; I’ve purchased a lot of healthy, cheap and still-good food this way (see photo above). Don’t ignore this option if you’re cooking on a budget. Also, don’t ignore frozen vegetables. They are cheap, healthy and easy to have on hand, plus they were frozen when that vegetable was actually in season. Fresh vegetables aren’t always the best option, especially on a tight budget. Shop the bulk department for grains, legumes and spices; skipping the inflated packaging makes a huge difference in price. Dried beans are far less expensive than canned, and they don’t contain excess salt, either. Soaking beans overnight takes virtually no time and a slow cooker makes preparing healthy food easy. Search out local ethnic markets. I could have spent substantially less on produce and beans if I had gone to any one of our incredible Mexican markets here in Denver. I wouldn’t buy animal products there, but I’d definitely buy pantry staples. Pasta is oft-maligned, but it is quick, inexpensive, filling, and most importantly easy to pack with lots of vegetables. Get a good knife and a good cutting board and learn how to prep your own fruits and vegetables. Paying for the precut product costs a lot extra and it’s already started to deteriorate, too. Think nutrient-dense and lots of color: discounted spinach, sturdy kale or purple cabbage rather than cheap but nutritionally vacant iceberg; black beans over pinto beans. Whenever possible, choose the most intensely colored whole food (that Windex-colored Gatorade does not qualify). And think high flavor, too. I used small amounts of bacon, sharp, salty queso fresco and crunchy nuts and seeds to add a lot of flavor and texture to our dishes. You don’t need much, but they add interest. I spent money on onions, garlic, scallions and cilantro, both because they’re healthy and because they add a ton of flavor and punch without spending a fortune. Growing your own fresh herbs is a great way to enhance your meals. We had quite a bit of food remaining at the end of the week (both prepared and raw ingredients); this is partially why our final day incorporated “favorites.” If you want to eat on a budget, you have to make use of leftovers, too. Throwing away food is exactly the same as throwing away money. Garlicky white beans and kale with fried eggs: pretty much perfect, in my opinion. N pointed out that this challenge was easy for me, because I know how to prepare healthy, delicious food and enjoy doing so. While that’s certainly true, I would say yet again that the number-one best thing you can do for both your physical and your financial health is to learn how to cook, and cook often – whether or not you’re on a strict food budget. Take responsibility for your own health, and cook yourself some wholesome, tasty food. You don’t need to break the bank to do that. If you choose to organize your own food stamp challenge, please share it with us!